Every commercial poultry farmer, hobby farmer or urban backyard farmer who keep a few chickens is aware that a pecking order exists in every flock, but how can young chicks fit into that hierarchy? Understanding the pecking order of chickens can help you add chicks to your flock without creating social problems for all the birds. The pecking order is the rank of individual birds within your unique flock, with stronger, more dominant birds occupying higher ranks while weaker, more submissive birds are lower in the pecking order. Birds higher in the pecking order generally eat first or have better access to food, water, prime roosting spots, preferred nest boxes and even dust bathing areas. Less important birds have to wait their turn, and if the hierarchy is severe, chickens at the bottom of the pecking order may be relentlessly bullied, chased or even attacked. The top bird of the flock doesn't have it easy, however. The bird earns this rank not only by being the strongest, healthiest, most dominant chicken in the flock, but also by being the best lookout and guard to alert other birds to any predators or potential dangers. The dominant bird will also find the best food sources or dust bathing areas. Other birds will then be happy to follow the lead of this top bird, but if another chicken becomes better at caring for the flock, the loyalties of more submissive birds can change and that top bird may not be on top anymore. The pecking order can also change when two strong birds argue over who is better. Posturing such as wing flaps, fluffing feathers and crowing can be considered challenges, and more physical and aggressive altercations such as chasing, scuffles or charging can occur between two battling birds. They will peck at one another, possibly even causing injuries, until one bird yields. As birds age and their health fluctuates, their rank in the flock's pecking order can easily shift. Young chicks begin to develop a pecking order just a few days after they've hatched, whether they're part of a single brood from one hen or are a mixed flock being raised independently. At first, the pecking order begins just around food, as stronger, quicker chicks push their way to eat better than smaller birds, and the smaller birds learn to yield in order to avoid more aggressive actions. As the chicks grow, they will continue to reinforce their social standings, and will have a highly developed pecking order by the time they reach mature size. Because a flock of young chicks will build their own pecking order, you must be very careful and patient when introducing young birds to an established flock, so both groups of birds can sort out their combined hierarchy. Do not attempt to introduce chicks to a flock until they are nearly their adult sizes, or else the young birds could be attacked and bullied into submission, even getting gravely injured in the process. Introduce the two groups of birds slowly, keeping them separated with fencing until they recognize one another and feel more at ease. Gradual exposure can help the birds begin to see which new birds are more dominant or submissive without needing physical altercations. When helping a flock of old and young chickens create a new pecking order, it is best to have multiple food and water stations available so there will be less overall fighting. There should be good space throughout the coop and run so no bird feels cramped or crowded, and some simple hiding spaces for birds to retreat can help keep the peace. Chicks may not have as strong of a pecking order as an adult chicken flock, but they do have their own social standings. 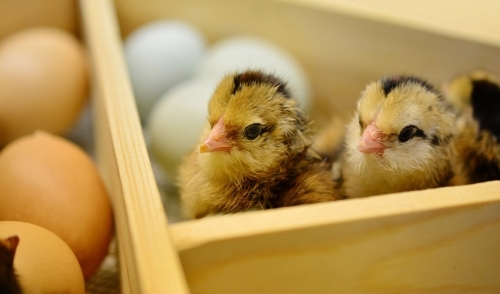 Understanding the pecking order in chicks and chickens can help you adjust to your birds' social structures and keep every bird safe and comfortable, from your top chicken to the lowest chick.